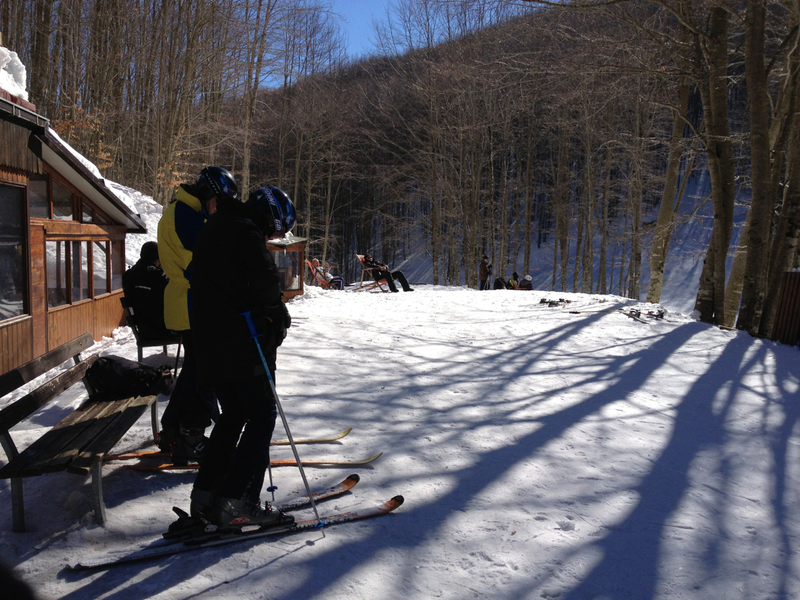 Of course there were plenty of skiers, but there seemed to be almost as many keen to just be in the mountains. For a start no-one, unless they were foreigners and there didn’t seem to be many of those, had come away for a ‘week’s skiing’, rather everyone was out to enjoy a ‘settimana bianca‘ – a white week (or perhaps even a day). Mid-February last year we visited Lago Laceno, which is a little over three hours south of Rome, and an easy day trip from Naples. There are woods, there is peace and the pace is up to you. My day was very slow motion. I took an occasional lift to admire the view but in between, like the gentleman above, spent much of the time reclining. Lunch was a happy interruption. 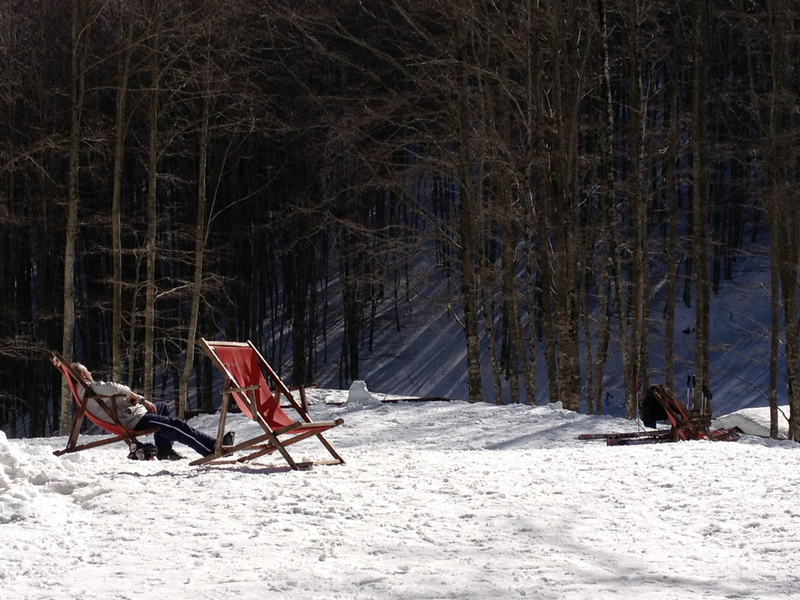 We had it half-way up the slopes, squeezed into the back of a small, noisy restaurant crowded with Italians. Bread baskets and bottles of wine thumped on to tables, followed by steaming plates of food including my own spaghetti with shavings of local truffle. 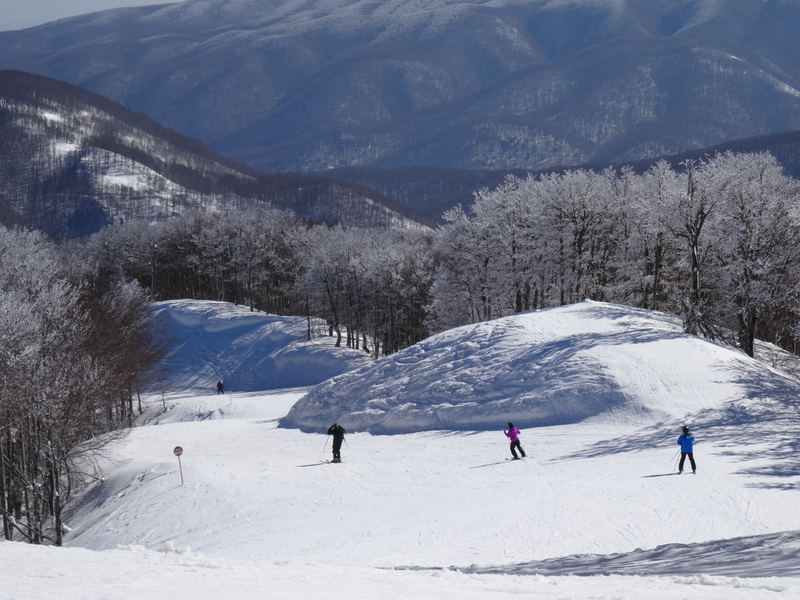 Unsurprisingly post-lunch activity had fewer takers but there were still 12 runs to choose from including steep blacks, with snow-tubing on offer as an aside. 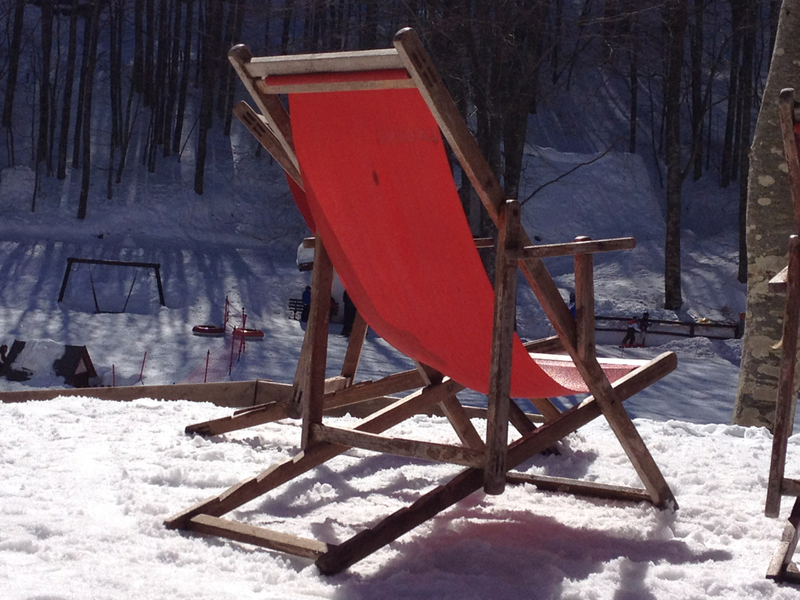 I considered the choice from a deckchair. We left as the sun went down, sunburnt and fresh-aired with an armful of cheese and a small tub of fresh ricotta. We hadn’t planned on the cheese, we’d even tried to resist, but we were no match for the wily charms of a veteran saleslady and her produce-filled, battered Fiat. 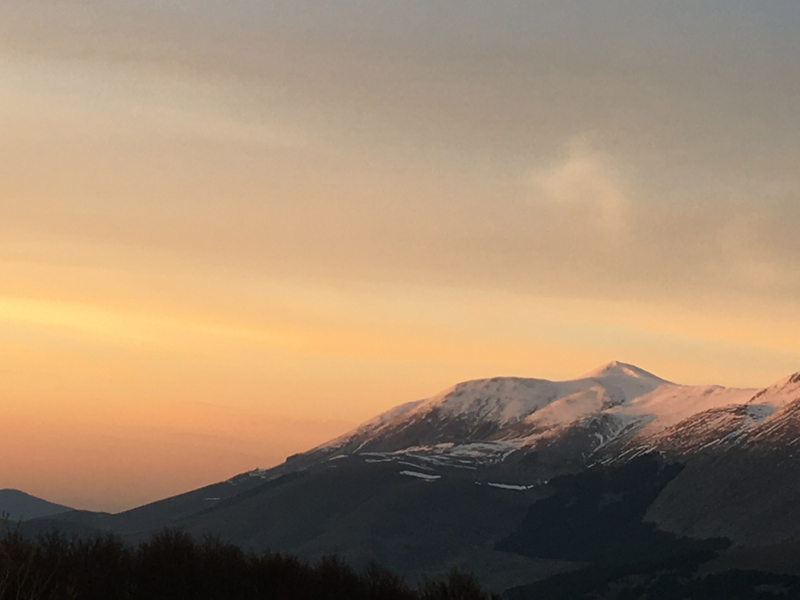 Last month we headed further north for our skiing – still in the Apennines and south of Rome, but this time we went to Roccaraso. Roccaraso is ten times bigger than Lago Laceno. 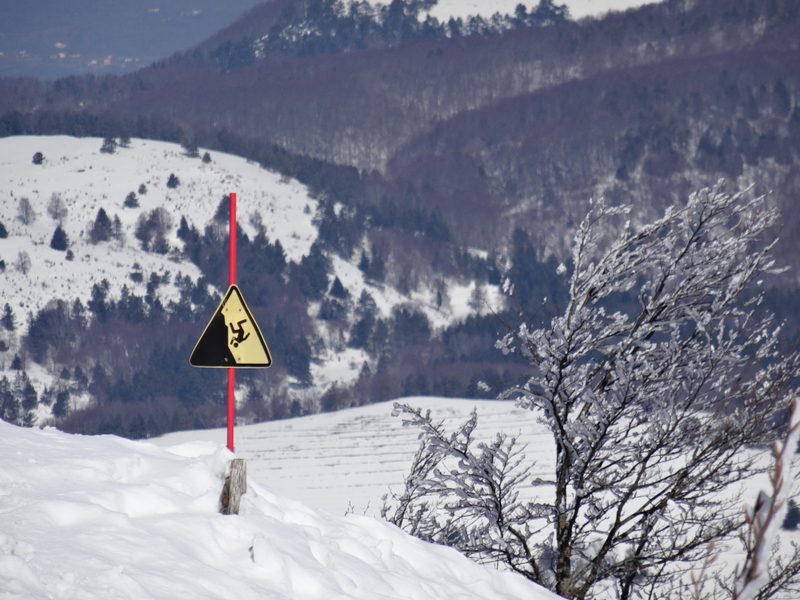 There are 120km of ski slopes with over twenty lifts, enough to keep the pistes busy and the queues minimal. It was the Easter weekend, we had three days in the mountains and they turned out to be warm and sunny. 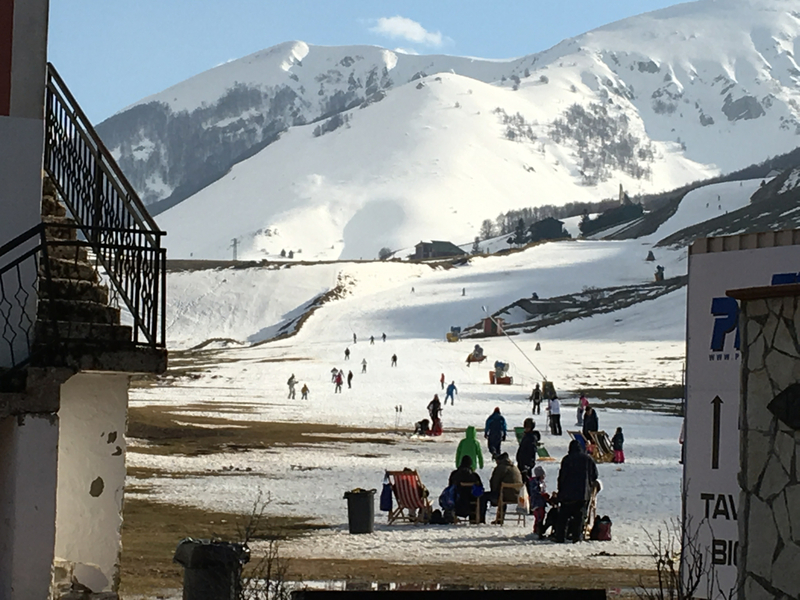 The snow was in retreat but nearly all the slopes were still open and by mid-morning each day, a kind of piazza had popped up on the flat ground by the lifts at Pizzalto – families, deck chairs, picnics, footballs and dogs. 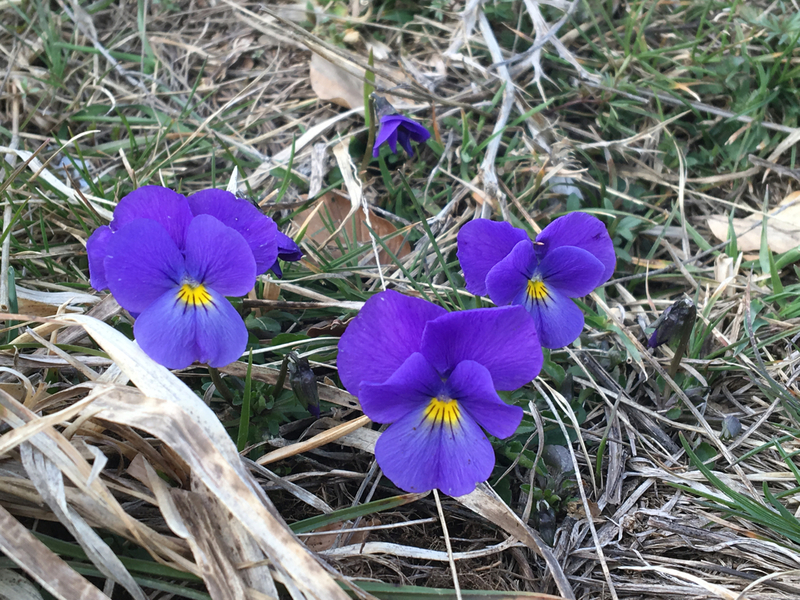 It was obviously the perfect way to make the best of the last of the winter in the mountains … and there was no requirement at all to be attached to a pair of skis. 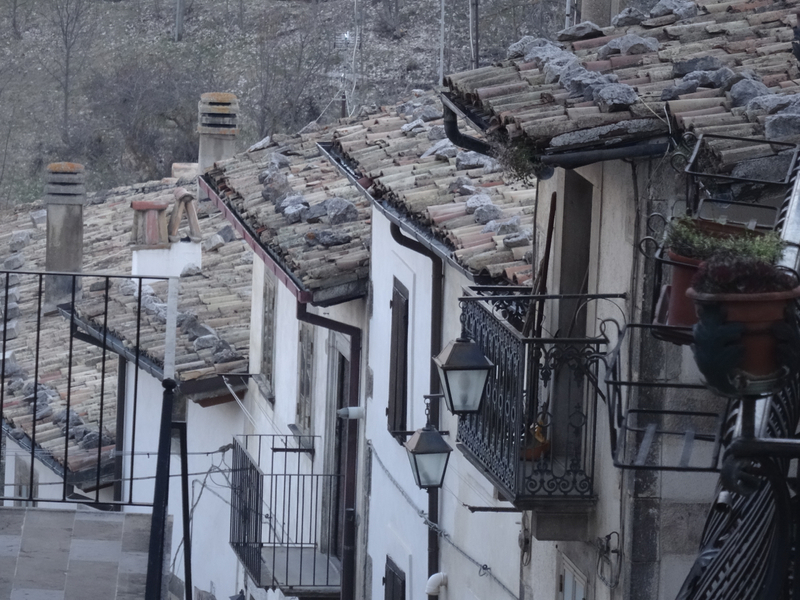 When the sun went and the skiing was done, we headed off to visit the local towns. We visited two. 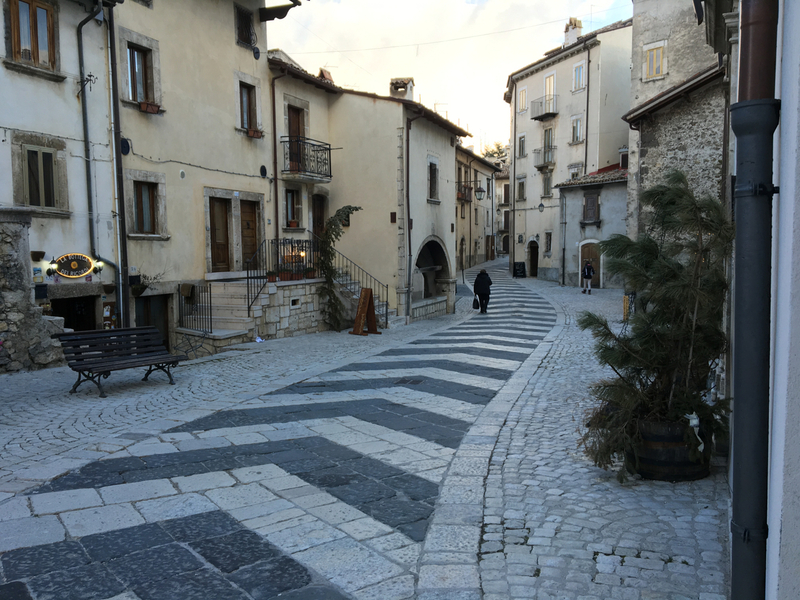 The first, about 5km from the ski-lifts at Pizzalto, was Roccaraso itself, now very much a purpose built, family holiday village. The second, a little distance beyond Roccarasso, in the next valley along, was Pescocostanzo. This village, renowned for its craftsmen, seems to be rooted where it’s always stood. It’s elegant and gracious, with black-striped roads that drag the eye to the edge of every corner. Our last ‘aperitivi’ of that Easter trip was in a friendly bar off the central square in Pescocostanza, our table laden with delicious snacks. We lingered and then wandered, and by the time we left to drive out of the valley it was dark, very dark as the snow had gone from the beech woods. The car’s lights picked out the curves as we wound slowly upwards, wary of ice on the empty road. It was on one of the highest turns that we saw the wolf. He was alone, caught briefly by our beams of light before he crossed the tarmac to head off into the dark. 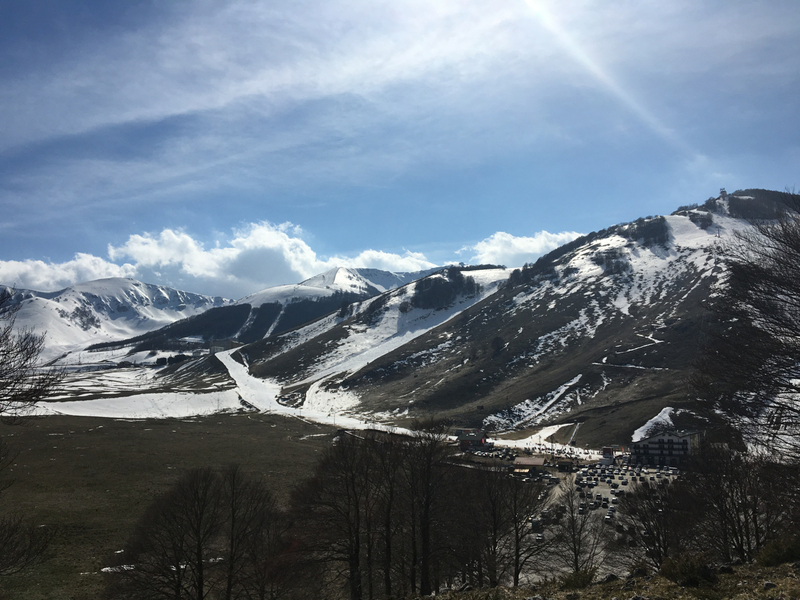 He was our first and only sighting of an Abruzzo wolf – a fine end to three days of skiing south of Rome, and a reminder that there’s far more to the Apennines and Abruzzo than just the ski slopes. 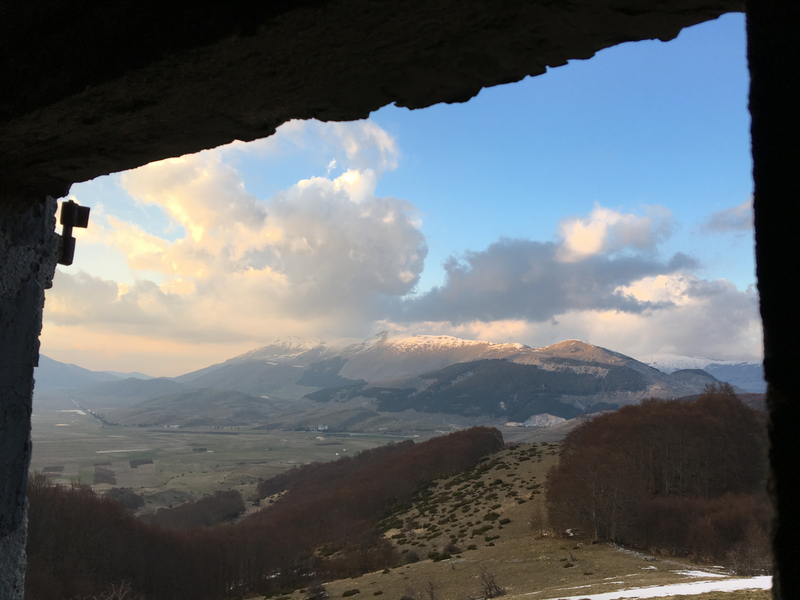 This entry was posted in Campania, Italy, Lago Laceno and tagged Abruzzo, Apennines, Avellino, Lago Laceno, Pescocostanza, Roccaraso, Rome, skiing, wolf. Bookmark the permalink. 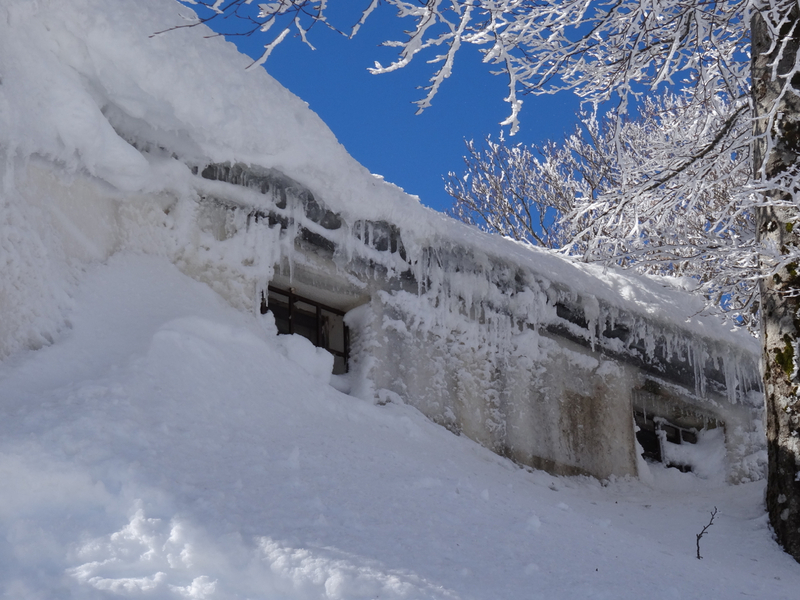 Wonderful to have this insight into winter in Italy when I have only ever experienced Summers, Springs and Autumns. In fact I associate Italy with being hot. 🙂 May I please ask for an idea of whether a day on the mountain is expensive. (In New Zealand where I live it is around 120 Euro a day including liftpass and full gear hire with clothing). Hi – we’ve so enjoyed the cool this year especially after the hot summer of 2015. Sadly, I don’t think that this year’s snow will last as long in the south as did last season. As for the prices I’ll pass on the Pizzalto details which we still have with us here. A day’s 4*ski, boot, helmet and ski pole hire for an adult in high season works out at 34 Euro a day, and a day’s ski pass in high season for an adult for the slopes of both Alto Sangro and Pizzalto (you’d probably want both) would be 69 Euro – total 103 Euro. Prices reduce the longer you ski – ski pass for seven days both areas = 390 Euro. Hope that helps and apologies if I’ve got any errors in there – am working from a list of prices that came home with us. Thanks Aggie – you’re so right about the excitement of seeing a wolf, especially seeing one in a place where wolves still belong.